Connection to canon characters (if applicable): Younger sister of Iris and Dahlia Hawthorne, half-sister and legal guardian of Pearl Fey (Pearl doesn't seem to have anyone looking after her in canon? Maya's there, but she's often away doing other things with Phoenix, so I figured she'd have to have someone looking after her back home... thus Lily was born). Half-sister of Valerie Hawthorne, daughter of Morgan Fey, cousin of Mia and Maya Fey. Works under Detective Ema Skye. 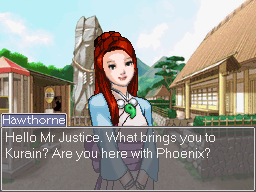 Friendly with Phoenix through his connection to Pearl and Maya. Knows a lot of attorneys and prosecutors from her work, but not on a first-name basis with many of them. Brief Physical Description: Lily is similar to her older sisters Iris and Dahlia in terms of height and build (and often mimicks their posture, due to a childhood spent idolising them, although she is not aware she does this). 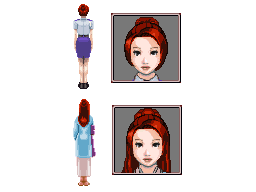 She has long red hair, which she wears in a practical bun while working and half-up, half-down the rest of the time. 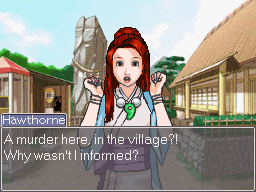 Around Kurain Village she wears her acolyte clothes, which are light blue and purple, with a green magatama. Since she is an adult, her robes are long and reach her ankles. 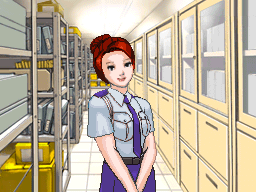 For work she wears her police uniform with her magatama clipped to her belt (she uses it to detect psych locks but generally passes it off as a good luck charm). Lily is a reliable and competent police officer who outwardly appears friendly, if a little serious and proper. However, she is very distrustful and suspicious by nature, mostly due to her past with Dahlia, and tends to hold people at arms length, even those she likes, and can be quick to assume the worst of people. The exception to this is Pearl, who she adores and believes can do no wrong. Generally easy to get on with, however she will become tense and defensive quickly if things do not go her way or if her past is brought up. Being the sister of a convicted murderer is an especially sore point for her. She has a strong sense of moral duty and can be relied upon to do the right thing, but never assumes others will do the same. Lily was born a few months after Morgan's husband left her. Morgan hoped she would be spiritually powerful, but by the time she was 5 and still wasn't showing any signs of power, Morgan lost interest and packed her off to live with her father. Lily had a fairly happy upbringing there and became close with Dahlia and Valerie (and Iris when she eventually met her) and looked up to them. Dahlia's murder of Valerie when Lily was 15 came as a great shock from which she never quite recovered, and she became estranged from her sisters in the aftermath. Iris's decision to continue helping her twin caused a rift between her and Lily, and they lost contact. She initially approached Diego Armando and attempted to help him gather evidence against Dahlia so Valerie could have justice, but became terrified of what Dahlia might do to her after Diego was poisoned and dropped the matter. Lily met Mia after Dahlia was arrested in State vs Wright, and got to know Maya and Pearl slowly through her. After graduating, Lily joined the police academy with the vague idea of honouring Valerie by following in her footsteps and making sure criminals like Dahlia didn't escape so easily. She graduated and became a police officer in her local district. After State vs Fey when Morgan was jailed, Lily was Pearl's closest remaining relative, so she became her legal guardian. She returned to Kurain Village and worked at the nearest regional police station. She and Maya took care of Pearl together while Maya continued her training. After a little while, she adopted the habit of wearing traditional medium clothes while in the village. Later, when Pearl was older and required less care, Lily was offered a promotion to work in the city under Detective Skye. Lily took the job, returning to the village on her days off. With the help of Maya and Pearl, Lily discovered that she had more spiritual power than she thought. While she'd learnt how to use her magatama to create, detect and break psych locks and how to meditate from Iris when she was younger, she hadn't attempted channelling since being sent away by her mother, and found that with practice, and away from Morgan's pressure and scolding, she had enough power to channel, although it's weak and doesn't always work. She is currently training alongside Pearl to attempt to get better, although she is far less powerful than her sister. She tries to keep her home and work life separate to avoid breaking police guidelines, but cannot deny the usefulness of psyche locks in her field, so she keeps her magatama with her at all times. This has earned her a reputation in the force for seeing through lies, which she feels she doesn't quite deserve, since she has supernatural help no one else is aware of. She lives in fear of her superior, Detective Skye, finding out about it, as she thinks very highly of her boss and is sure Ema would disapprove of such 'unscientific' methods. She remains close to her sister Valerie and her cousin Mia, and she, Pearl and Maya sometimes channel them for each other so they can talk. Phew, I haven't made any of my own sprites before, but this was fun! Page took 0.019 s to generate.